Vincent van Gogh (1853–1890), The Blue Train (Viaduct in Arles) (1888), oil on canvas, 46 x 49.5 cm, Musée Rodin, Paris. Wikimedia Commons. 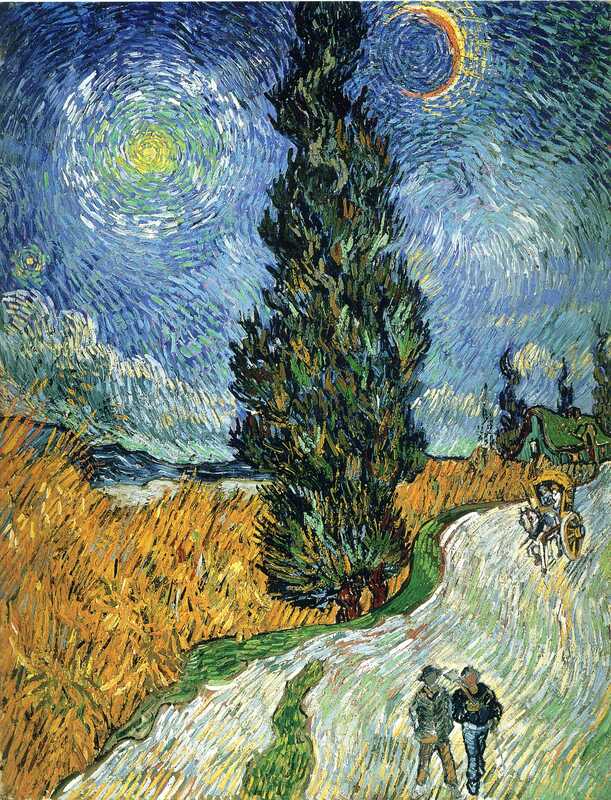 If any artist lived the life of a restless spirit, it was Vincent van Gogh. Understanding that constant search, the forces that changed his painting to result in his final few climactic years, is surely key to reading and more deeply appreciating his genius. Conventional biographies lead us through the succession of places that he lived, occupations that he tried, and crises which he faced, and overcame. But painting a vivid picture of Etten in 1881, or Nuenen in 1883-85 using words is very difficult. Even then, it is hard to build a good understanding of how much and how far he travelled: the list of locations is just another half-remembered list. This book fills this gap in the literature about van Gogh in a unique way: with maps, contemporary photographs, copies of the artist’s own letters and notes, and of course many of his own drawings and paintings. It is not a glossy coffee-table tome bursting with full-page colour reproductions of those paintings – they are usually small, but sufficiently large for the reader to know which they wish to see in better detail. It is designed partly in the spirit of those portfolios containing reproductions of important documents which invariably get misplaced or damaged, but this book is not a gimmick like those. Its end-papers may be laid out like a scrap-book, but inside there is nothing faux about it. Its table of contents is not just matched by a grand map plotting all his movements, but links to a timeline too. Time and place are the heart of the book. The start of each location/section/period in his life orientates the reader, explaining how this fits in with his life-story, what he was doing, and why. There are photos of the principal characters involved, postcards or other images of the location, and superb maps and plans. Significant buildings – where his studio was, where he lodged or lived – are shown wherever possible, and paintings and other objects which were particularly important to him then or later. We are told what van Gogh spent his time doing in that location, whether he attended church much, where he walked, and so on. Accompanying this are small reproductions of his cards, letters, and other writings, and of course a selection of his own drawings and paintings. The text is written in plain English which may at first seem a little pedagogic, but ensures a readership of almost all ages. 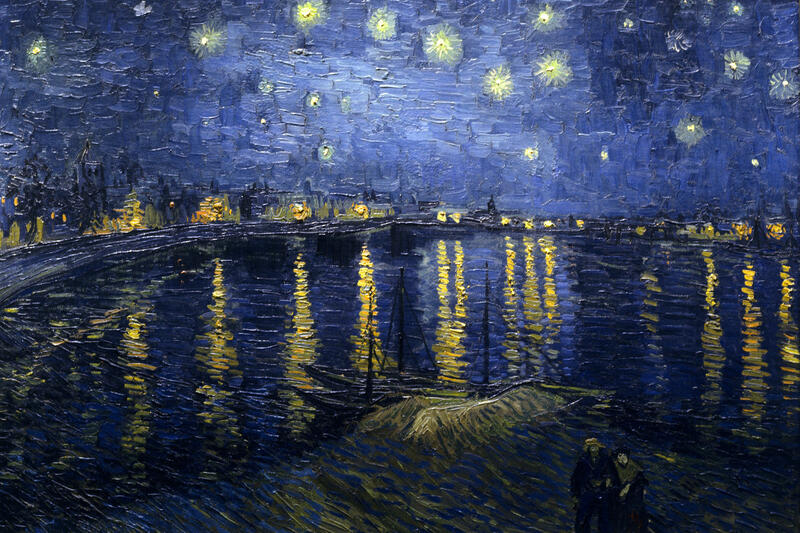 Inevitably it refers to van Gogh’s sexually-transmitted disease, affairs, and suicide, so should be used with caution by younger children, perhaps. A valuable side-effect is that it is easy to read for everyone, and the words complement the copious images, rather than distracting from them. Of all the locations/sections/periods in the book, I found the account of his period (in 1889-90) in the psychiatric clinic at Saint-Rémy-de-Provence the most fascinating, as I understood so little about what it was really like. There are several excellent photos, including one apparently taken from a nearby hill, with small enlargements to show the locations of the artist’s room and studio. Further photos show the window of his studio (from inside), and his room in the 1950s, and the clinic’s hydrotherapy baths. 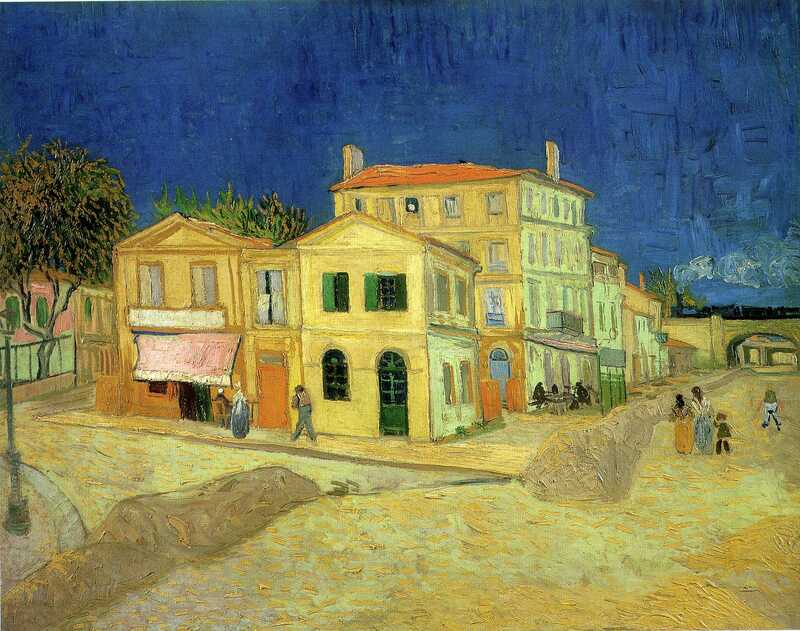 There are 11 reproductions of van Gogh’s paintings from his time at the clinic, a partial copy of a letter from van Gogh to his brother Théo of 22 August 1889. The text steps carefully through his progressively increasing freedom, through painting in the gardens, and into the Alpilles there, and his unfortunate relapses. 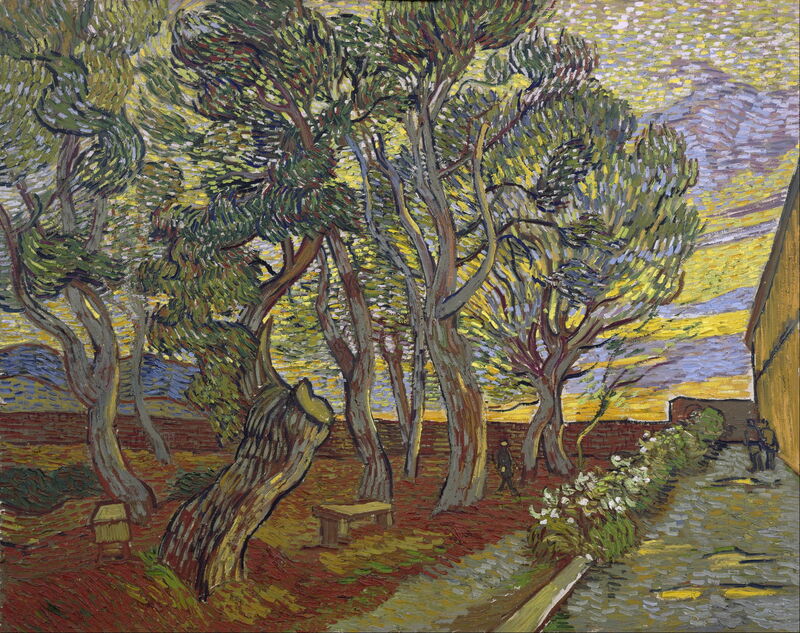 Vincent van Gogh (1853–1890), The Garden of Saint Paul’s Hospital (1889), oil on canvas, 71.5 x 90.5 cm, Van Gogh Museum, Amsterdam. Wikimedia Commons. The main text and images end with a short account of Jo van Gogh-Bonger’s work to publish Vincent’s letters and promote his art, leading to the Van Gogh Museum, and a moving full-page spread of Vincent and Théo’s graves at Auvers. After that, there is one page of further information, which includes a small selection of websites, but strangely does not recommend any further reading, which is the one slight regret that I have about this wonderful book. I have not attempted to check any of the information given: Teio Meedendorp is a leading expert on Vincent van Gogh who is probably the authority on the subject, and René van Blerk is a senior educator at the Van Gogh Museum. You can’t get any better. This is one of the most fascinating and insightful books about any artist that I have read. Instead of presenting the author’s interpretation of their art, it provides the reader with contemporary information – primarily visual, but well-supported by its text – which helps them understand what the artist experienced. For Vincent van Gogh, this is particularly important. As the book makes clear, his life was a tumultuous succession of places, occupations, and events. From the age of 20, he lived and worked in 13 different locations in four different countries, from the gloom and grime of the Borinage coalfield in Belgium, to the sparkling light of Arles in Provence – in those 17 highly-productive years before he died. This is the only book which I have seen which brings each of these to life. This is an ideal Christmas gift for anyone of almost any age who has the slightest interest in Vincent van Gogh and his art. You’ll also want to buy yourself a copy. Highly recommended. Posted in General, Life, Painting and tagged atlas, biography, book, review, van Gogh. Bookmark the permalink.